And now for something completely different! I missed hosting giveaways! 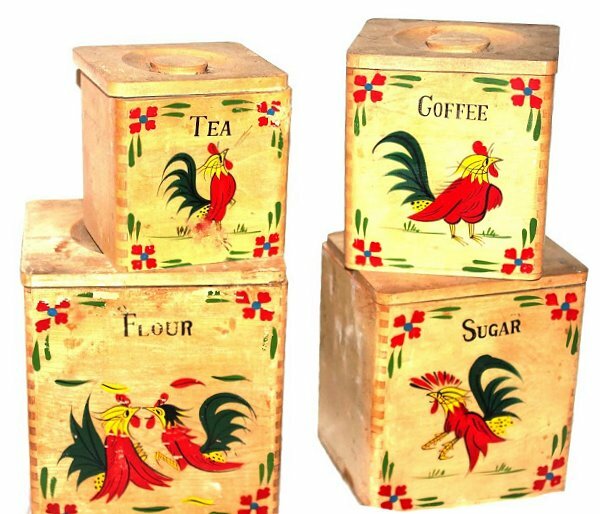 Today Stella and Stanley's Antiques and Collectibles are offering the retro rooster Flour, Tea, Coffee, and Sugar canisters. I absolutely love these because they remind me of my favorite 1930s cartoons. To Enter: "Like" their Facebook page and leave a comment that includes your e-mail so I can contact you if you win! If you're in Orlando, Florida visit Stella and Stanley's antique mall booth at College Park Antique Market, 4321 Edgewater Drive, Orlando, Florida 32804. They're also located at Adjectives Vintage Market 1215 E. Altamonte Dr. (SR 436) Altamonte Springs, FL. I'll randomly pick a commenter and announce the winner of this Giveaway Friday July 26th. Stella and Stanley is a Thrift Core sponsor. If you need help designing your blog, starting an online store, or promoting yourself send me an e-mail. I'd love to help! Read more about sponsoring or buy an ad here. Same here, it's rare to see them all together! Love your posts! I'm a fan of vintage items and can't past up any of your postings...love them all! Also I follow Thriftcore with Bloglovin'. And now I'm watching Stella and Stanley on Pinterest... I just wish it was closer to home! Some lovely stuff there. I like your page on FB (HilLesha O'Nan). I'm following you via Pinterest. I'm following you via Instagram (RareElegance). I like Thrift Core on FB (HilLesha O'Nan). I'm following Thrift Core via Twitter (HilLesha). I'm following Thrift Core via BlogLovin. Those are so stinking cute! I love them!